These easy to make shortbread cookies are rolled into a shortbread dough log, wrapped up in parchment or waxed paper and then placed in the fridge to firm up. Slice and bake and voila shortbread heaven. My mom always made shortbread during the holidays, sometimes it worked, sometimes, not so much. I decided that there must be a fool proof shortbread recipe somewhere, so every year I would try out a new recipe, all not so wonderful. Then I discovered an amazing shortbread cookie from the Toronto Star. Success, fool proof and fabulous. 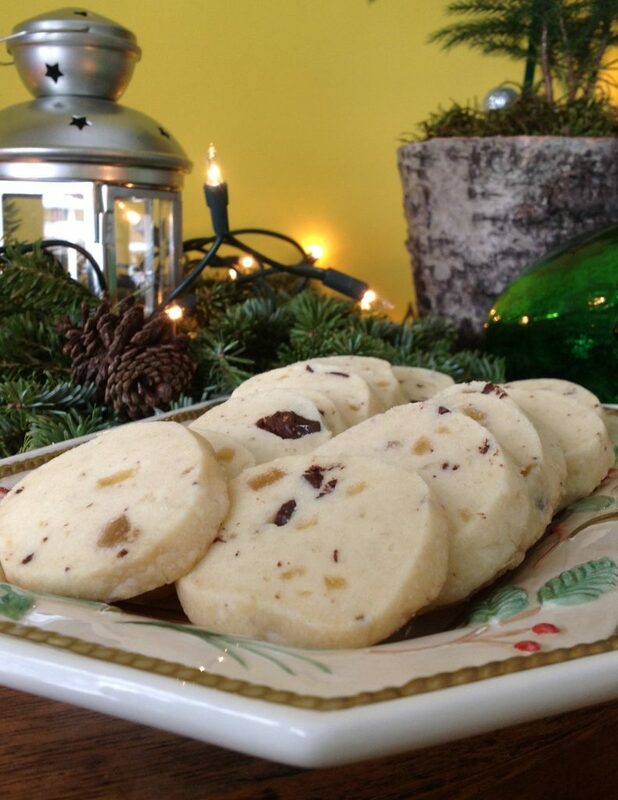 Thanks to then Food Editor Jennifer Bain at the Toronto Star who has now become their Travel Editor, here is my favourite fool proof shortbread cookie. It’s sort of like my mom’s recipe when her recipe worked, but with a twist – I added ginger and chocolate, and… bonus it works every time. 1 ½ cups (375 mL) all-purpose flour, sifted – measure by spooning the flour into a dry measuring cup and then leveling it off with a straight edge. In medium bowl, whisk together flour, corn starch, salt, ¼ cup (60 mL) dark chocolate pieces or chips, and ginger. In separate bowl, using electric mixer on low then medium speed, beat butter and sugar until fluffy. Gently pat dough into block about 1.5 inches (4 cm) high and 2.5 inches (6 cm) wide or smaller if desired. 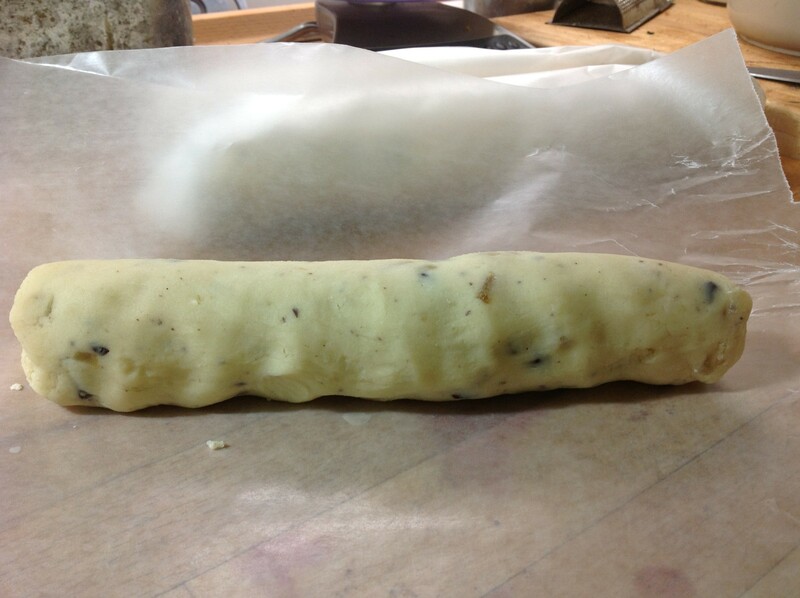 Wrap in wax paper and refrigerate until very firm, at least 2 hours or overnight. Place slices of cookie dough on prepared baking sheet. Remove from heat and let cookies sit 5 minutes. Carefully transfer cookies to wire rack to cool completely. Nutrient Breakdown: I don’t think so, it’s a Christmas cookie, have one…………….. This year I decided to try adding crushed candy canes instead of the ginger and chocolate. They are a tad sweeter, but they were still excellent. Sub out the ginger and chocolate and use crushed candy canes. 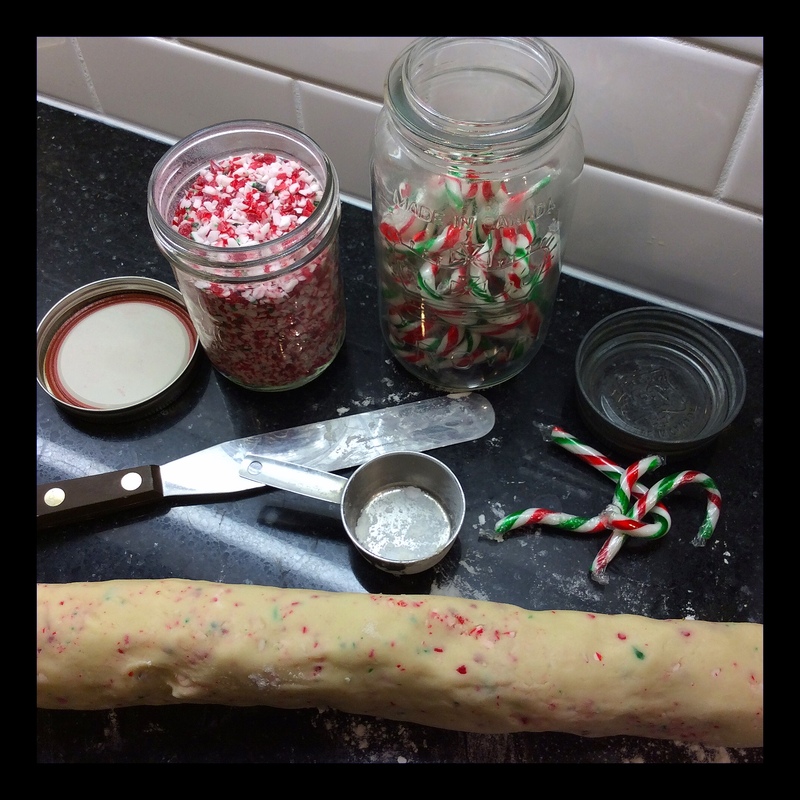 If using crushed candy canes instead, how much? Thanks. I used the same amount as the chocolate and ginger combined, but you can use less. Look good and I will make them. Do you have a good recipe for gluten free shortbread? Marilyn, just finished baking some of these for New Years celebrations tonite as a sweet. They are fabulous, and thanks for sharing this recipe. Happy New Year. Looking forward to more great recipes. Yay! and sorry this is so late!